Calendar of Treasury Books, Volume 14, 1698-1699. Originally published by His Majesty's Stationery Office, London, 1934. J., J., invited to make out a discovery, 311. Jackson, . accounts of R. Williamson, 49. -, Ralph, collector of Excise, Bedford, 33, 180. -, William, tidesman, Bristol port, 245. Jacob (Jacobs), , Mrs., pension for, 143. -, Sir John, colonel, 69; regiment of, 296, 314. Jamaica, chaplains for. See Bolton, ; Poxen, ; Todd, T.; Walbanke, . -, Commander-in-Chief of. See Beeston, Sir W.
-, export of bell to, 228. -, Forces transported to, 61, 285, 291, 401. -, Governor of. See Beeston, Sir W.
-, provisions for Benbow's squadron, 203, 396. -, ships to, 61, 285, 291, 401. -, See also Port Royal. James I, 257; grant by, 317; lease by, 361. James II, 20, 26, 153, 155. -, drinking of health of, 41. -, Treasurer of the Chamber to. See Griffin, Lord. James, Francis, boatman, Hayle, 131. -, Samuel, tidesman, Plymouth, 169. Jamestown, St. James Town, New York, forts at, 123. Janeway, Jacob, moiety of seizure of wool, 237. Jansen (Janssen), Sir Theodore, 97, 410; a Receiver of the subscriptions for the Two Millions, 9, 71, 119, 143, 211, 213, 239, 240, 3145; remittance for the Household in Holland, 49, 237; a trustee for circulating Exchequer Bills, 149, 281. Jedburgh (Jedborough, Jedburg), Lord. See Kerr, W.
Jeffreys (Jefferies, Jefferyes, Jeffries), Sir George, late Lord Chancellor, 203. -, Sir James, pension of, 141. -, Jeffery, petition concerning the Canterbury, 110, 121. -, -, et al., report, 7. -, Thomas, noli prosequi to judgment for transporting corn, 248, 307. Jekyll (Jekel, Jekill, Jekyl), , life grant of office of Clerk of the Hanaper, 125. -, Sir Joseph, Chief Justice of Chester, 229, 285, 400, 407; concerning the office of chief searcher, London port, 34, 35, 38. 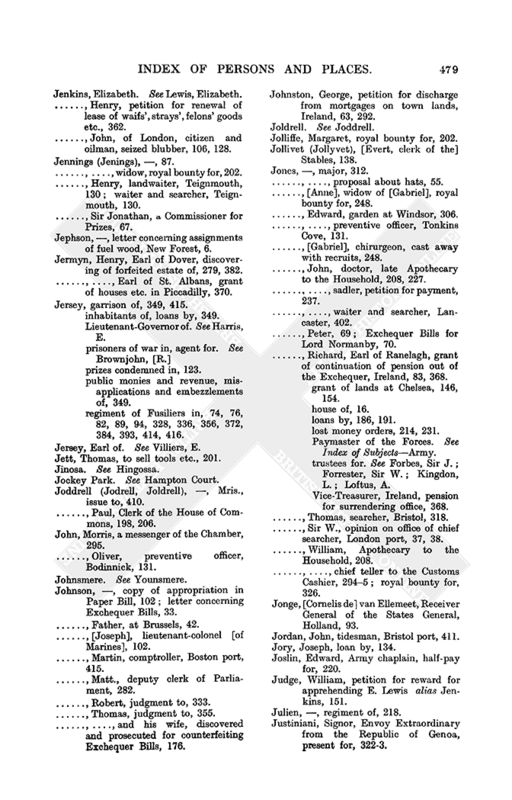 Jellett, , ensign, killed at Aughrim, 248. -, Anne, widow, royal bounty for, 248. Jemmett, John, case against N. Miles, 269. -, -, riding officer, Kent coast, 316. Jenkins, Elizabeth. See Lewis, Elizabeth. -, Henry, petition for renewal of lease of waifs', strays', felons' goods etc., 362. -, John, of London, citizen and oilman, seized blubber, 106, 128. -, -, widow, royal bounty for, 202. -, Henry, landwaiter, Teignmouth, 130; waiter and searcher, Teignmouth, 130. -, Sir Jonathan, a Commissioner for Prizes, 67. Jephson, , letter concerning assignments of fuel wood, New Forest, 6. Jermyn, Henry, Earl of Dover, discovering of forfeited estate of, 279, 382. -, -, Earl of St. Albans, grant of houses etc. in Piccadilly, 370. Jersey, garrison of, 349, 415. -, inhabitants of, loans by, 349. -, Lieutenant-Governor of. See Harris, E.
-, prizes condemned in, 123. -, public monies and revenue, misapplications and embezzlements of, 349. -, regiment of Fusiliers in, 74, 76, 82, 89, 94, 328, 336, 356, 372, 384, 393, 414, 416. Jersey, Earl of. See Villiers, E.
Jett, Thomas, to sell tools etc., 201. Jockey Park. See Hampton Court. Joddrell (Jodrell, Joldrell), , Mris., issue to, 410. -, Paul, Clerk of the House of Commons, 198, 206. John, Morris, a messenger of the Chamber, 295. -, Oliver, preventive officer, Bodinnick, 131. 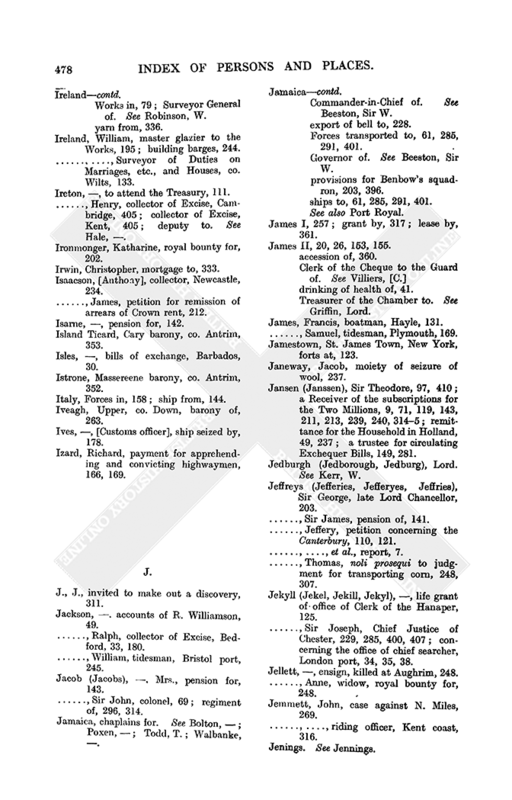 Johnson, , copy of appropriation in Paper Bill, 102; letter concerning Exchequer Bills, 33. -, Father, at Brussels, 42. -, [Joseph], lieutenant-colonel [of Marines], 102. -, Martin, comptroller, Boston port, 415. -, Matt., deputy clerk of Parliament, 282. -, Robert, judgment to, 333. -, Thomas, judgment to, 355. -, -, and his wife, discovered and prosecuted for counterfeiting Exchequer Bills, 176. Johnston, George, petition for discharge from mortgages on town lands, Ireland, 63, 292. Jolliffe, Margaret, royal bounty for, 202. Jollivet (Jollyvet), [Evert, clerk of the] Stables, 138. -, -, proposal about hats, 55. -, [Anne], widow of [Gabriel], royal bounty for, 248. -, Edward, garden at Windsor, 306. -, -, preventive officer, Tonkins Cove, 131. -, [Gabriel], chirurgeon, cast away with recruits, 248. -, John, doctor, late Apothecary to the Household, 208, 227. -, -, sadler, petition for payment, 237. -, -, waiter and searcher, Lancaster, 402. -, Peter, 69; Exchequer Bills for Lord Normanby, 70. -, Richard, Earl of Ranelagh, grant of continuation of pension out of the Exchequer, Ireland, 83, 368. -, grant of lands at Chelsea, 146, 154. 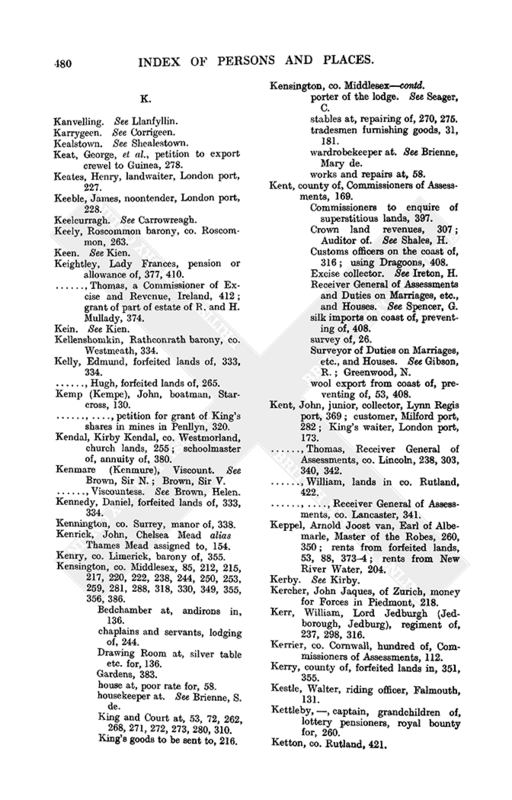 -, loans by, 186, 191. -, lost money orders, 214, 231. -, Paymaster of the Forces. See Index of SubjectsArmy. -, trustees for. See Forbes, Sir J.; Forrester, Sir W.; Kingdon, L.; Loftus, A. -, Vice-Treasurer, Ireland, pension for surrendering office, 368. -, Thomas, searcher, Bristol, 318. -, Sir W., opinion on office of chief searcher, London port, 37, 38. -, William, Apothecary to the Household, 208. -, -, chief teller to the Customs Cashier, 2945; royal bounty for, 326. Jonge, [Cornelis de] van Ellemeet, Receiver General of the States General, Holland, 93. Jordan, John, tidesman, Bristol port, 411. Jory, Joseph, loan by, 134. Joslin, Edward, Army chaplain, half-pay for, 220. Judge, William, petition for reward for apprehending E. Lewis alias Jenkins, 151. Julien, , regiment of, 218. Justiniani, Signor, Envoy Extraordinary from the Republic of Genoa, present for, 3223. Keat, George, et al., petition to export crewel to Guinea, 278. Keates, Henry, landwaiter, London port, 227. Keeble, James, noontender, London port, 228. Keely, Roscommon barony, co. Roscommon, 263. Keightley, Lady Frances, pension or allowance of, 377, 410. -, Thomas, a Commissioner of Excise and Revenue, Ireland, 412; grant of part of estate of R. and H. Mullady, 374. Kellenshomkin, Rathconrath barony, co. Westmeath, 334. Kelly, Edmund, forfeited lands of, 333, 334. -, Hugh, forfeited lands of, 265. Kemp (Kempe), John, boatman, Starcross, 130. -, -, petition for grant of King's shares in mines in Penllyn, 320. Kendal, Kirby Kendal, co. Westmorland, church lands, 255; schoolmaster of, annuity of, 380. Kenmare (Kenmure), Viscount. See Brown, Sir N.; Brown, Sir V.
-, Viscountess. See Brown, Helen. Kennedy, Daniel, forfeited lands of, 333, 334. Kennington, co. Surrey, manor of, 338. Kenrick, John, Chelsea Mead alias Thames Mead assigned to, 154. Kenry, co. Limerick, barony of, 355. Kensington, co. Middlesex, 85, 212, 215, 217, 220, 222, 238, 244, 250, 253, 259, 281, 288, 318, 330, 349, 355, 356, 386. -, Bedchamber at, andirons in, 136. -, chaplains and servants, lodging of, 244. -, Drawing Room at, silver table etc. for, 136. -, house at, poor rate for, 58. -, housekeeper at. See Brienne, S. de. -, King and Court at, 53, 72, 262, 268, 271, 272, 273, 280, 310. -, King's goods to be sent to, 216. -, porter of the lodge. See Seager, C.
-, stables at, repairing of, 270, 275. -, tradesmen furnishing goods, 31, 181. -, wardrobekeeper at. See Brienne, Mary de. -, works and repairs at, 58. Kent, county of, Commissioners of Assessments, 169. -, Commissioners to enquire of superstitious lands, 397. -, Crown land revenues, 307; Auditor of. See Shales, H.
-, Customs officers on the coast of, 316; using Dragoons, 408. -, Excise collector. See Ireton, H.
-, Receiver General of Assessments and Duties on Marriages, etc., and Houses. See Spencer, G.
-, silk imports on coast of, preventing of, 408. -, Surveyor of Duties on Marriages, etc., and Houses. See Gibson, R.; Greenwood, N.
-, wool export from coast of, preventing of, 53, 408. Kent, John, junior, collector, Lynn Regis port, 369; customer, Milford port, 282; King's waiter, London port, 173. -, Thomas, Receiver General of Assessments, co. Lincoln, 238, 303, 340, 342. -, William, lands in co. Rutland, 422. -, -, Receiver General of Assessments, co. Lancaster, 341. Keppel, Arnold Joost van, Earl of Albemarle, Master of the Robes, 260, 350; rents from forfeited lands, 53, 88, 3734; rents from New River Water, 204. Kercher, John Jaques, of Zurich, money for Forces in Piedmont, 218. Kerr, William, Lord Jedburgh (Jedborough, Jedburg), regiment of, 237, 298, 316. Kerrier, co. Cornwall, hundred of, Commissioners of Assessments, 112. Kerry, county of, forfeited lands in, 351, 355. Kestle, Walter, riding officer, Falmouth, 131. Kettleby, , captain, grandchildren of, lottery pensioners, royal bounty for, 260. Keyhaven, co. Southampton, ship of, 397. Kibbor, St. Kennith Kibbor, co. Glamorgan, hundred of, Commissioners of Assessments, 125. Kicke (Kicks), Abraham, Consul at Rotterdam, 357. 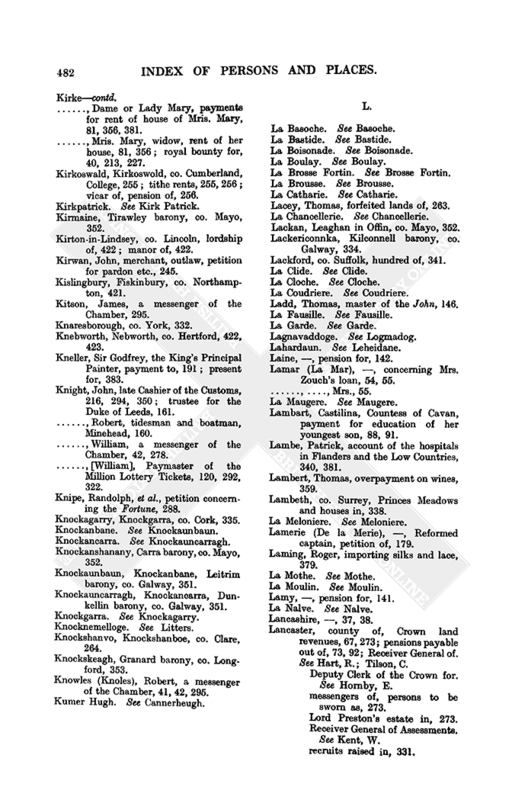 Kien (Keen, Kein), Rudolph, grant of forfeited lands, Ireland, 87, 373; Keeper of the Closet to the King, 226, 314; Page of the Bedchamber, 244; petition concerning his annuity, 87, 373. Kilballyherberry, Kilballihereby, co. Tipperary, 354. Kilblaffers, Barretts barony, co. Cork, 353. Kilcoline [?Killucan], co. Westmeath, 263. Kilconnell, Kilconell, co. Galway, barony of, 333, 334. Kilcoolishal, Kilcoolishell, co. Cork, 354. Kilcoursey, King's County, barony of, 354. Kilcross, Kilcrosse, co. Antrim, 352. Kildare, county of, forfeited lands in, 265, 369, 373. Kildare, Bishop of. See Moreton, W.
Kilkea and Moone, co. Kildare, barony of, 373. Kilkenny, county of, forfeited lands in, 351, 353. Kilkenny, co. Kilkenny, New Park in, 375. -, West, co. Westmeath, barony of, 333, 335. Killadoon, Killadowin, co. Kildare, 369. Killealy, Killilly, co. Antrim, 352. Killeen, Athenry barony, co. Galway, 334. Killeenagroagh, Killinegreagh, co. Westmeath, 334. Killeneknow, Rathconrath barony, co. Westmeath, 334. Killigrew, Charles, Master of the Masks and Revels, 197, 206. -, Henry, debt to Mr. Taylor, 5, 71, 96; King's Jester, liveries for, 38, 50, 207, 239; payments to, 5, 71, 73, 96; petition of, 71, 90; royal bounty for, 10, 121, 169. -, Sir Robert, pension of, 87, 92, 289, 366. Kilmacuagh, Kill McCogh, co. Roscommon, 265. Kilmartin, Kilvertine, Queen's County, 263. Kilree, Kilreagh, co. Roscommon, 263. Kiltecackly, Ballymoe barony, co. Galway, 334. Kilteel, Kilteele, co. Kildare, 369. 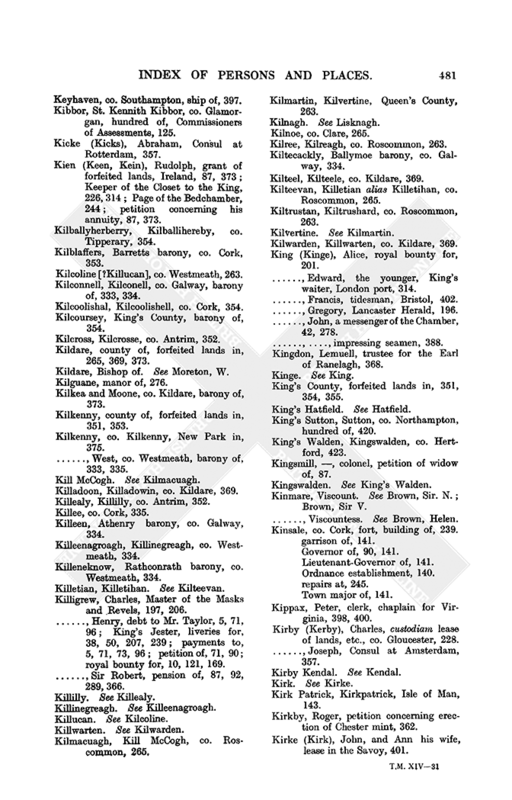 Kilteevan, Killetian alias Killetihan, co. Roscommon, 265. Kiltrustan, Kiltrushard, co. Roscommon, 263. Kilwarden, Killwarten, co. Kildare, 369. King (Kinge), Alice, royal bounty for, 201. -, Edward, the younger, King's waiter, London port, 314. -, Francis, tidesman, Bristol, 402. -, Gregory, Lancaster Herald, 196. -, John, a messenger of the Chamber, 42, 278. -, -, impressing seamen, 388. Kingdon, Lemuell, trustee for the Earl of Ranelagh, 368. King's County, forfeited lands in, 351, 354, 355. King's Sutton, Sutton, co. Northampton, hundred of, 420. King's Walden, Kingswalden, co. Hertford, 423. Kingsmill, , colonel, petition of widow of, 87. Kinmare, Viscount. See Brown, Sir. N.; Brown, Sir V.
Kinsale, co. Cork, fort, building of, 239. -, Governor of, 90, 141. -, Town major of, 141. Kippax, Peter, clerk, chaplain for Virginia, 398, 400. Kirby (Kerby), Charles, custodiam lease of lands, etc., co. Gloucester, 228. -, Joseph, Consul at Amsterdam, 357. Kirk Patrick, Kirkpatrick, Isle of Man, 143. Kirby, Roger, petition concerning erection of Chester mint, 362. Kirke (Kirk), John, and Ann his wife, lease in the Savoy, 401. -, Dame or Lady Mary, payments for rent of house of Mris. Mary, 81, 356, 381. -, Mris. Mary, widow, rent of her house, 81, 356; royal bounty for, 40, 213, 227. Kirkoswald, Kirkoswold, co. Cumberland, College, 255; tithe rents, 255, 256; vicar of, pension of, 256. Kirmaine, Tirawley barony, co. Mayo, 352. Kirton-in-Lindsey, co. Lincoln, lordship of, 422; manor of, 422. Kirwan, John, merchant, outlaw, petition for pardon etc., 245. Kislingbury, Fiskinbury, co. Northampton, 421. Kitson, James, a messenger of the Chamber, 295. Knebworth, Nebworth, co. Hertford, 422, 423. Kneller, Sir Godfrey, the King's Principal Painter, payment to, 191; present for, 383. Knight, John, late Cashier of the Customs, 216, 294, 350; trustee for the Duke of Leeds, 161. -, Robert, tidesman and boatman, Minehead, 160. -, William, a messenger of the Chamber, 42, 278. -, [William], Paymaster of the Million Lottery Tickets, 120, 292, 322. Knipe, Randolph, et al., petition concerning the Fortune, 288. Knockagarry, Knockgarra, co. Cork, 335. Knockanshanany, Carra barony, co. Mayo, 352. Knockaunbaun, Knockanbane, Leitrim barony, co. Galway, 351. Knockauncarragh, Knockancarra, Dunkellin barony, co. Galway, 351. Knockshanvo, Knockshanboe, co. Clare, 264. Knockskeagh, Granard barony, co. Longford, 353. Knowles (Knoles), Robert, a messenger of the Chamber, 41, 42, 295.